One graphic in the report shows the No. 1 attack experienced is: "An employee falls for a phishing scam that resulted in credential theft. More than a third (37 percent) report at least one significant disruption caused by malware and almost a quarter of organizations (23 percent) report at least one nation-state attack. Over a fifth (23 percent) report at least one instance of economic espionage or an instance of cyber extortion (21 percent), such as a ransomware attack. 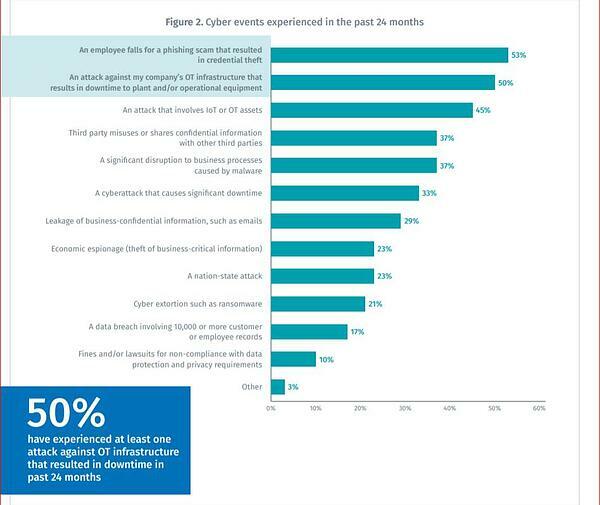 "OT professionals have spoken -- the people who manage critical systems such as manufacturing plants and transportation almost unanimously state that they are fighting-off cyberattacks on a regular basis," says Eitan Goldstein, senior director of strategic initiatives at Tenable. "Organizations need visibility into their converged IT/OT environments to not only identify where vulnerabilities exist but also prioritize which to remediate first. The converged IT/OT cyber problem is one that cybersecurity and critical infrastructure teams must face together." A lack of personnel and a reliance on manual processes are cited by 61 percent and 55 percent of respondents respectively as major obstacles in their ability to assess and remediate vulnerabilities. Also 70 percent of respondents view increasing communication with executives and board members as one of their governance priorities for 2019. Do you have a disaster recovery plan in place that takes into account having no power in your HQ? The full report is available from the Tenable website.